The ‘primitive’ and unique design was the talk of the Yatzer-town nearly two years ago with Primitive Living in Saijo, Hiroshima. 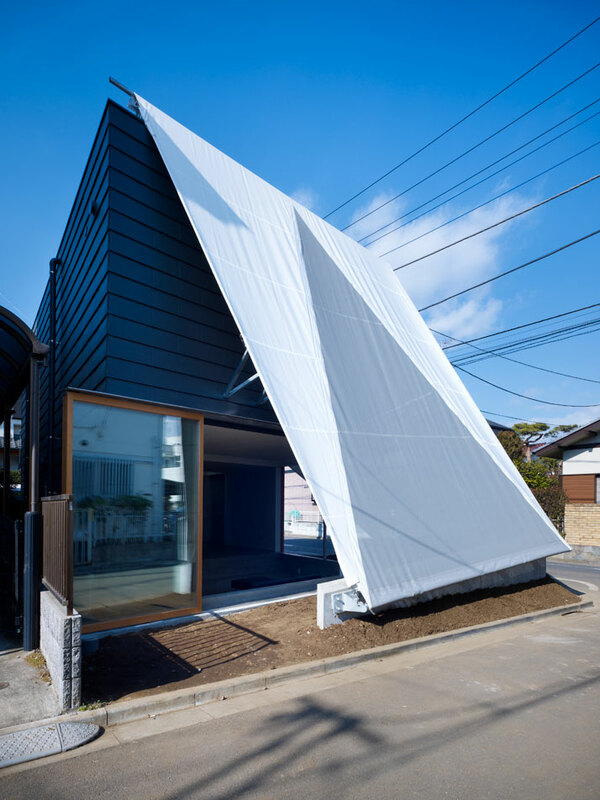 This time, the Japanese Suppose Design Office has designed a residential building in Kodaira-shi, Tokyo with a primitive-like tent affixed to the residential structure. 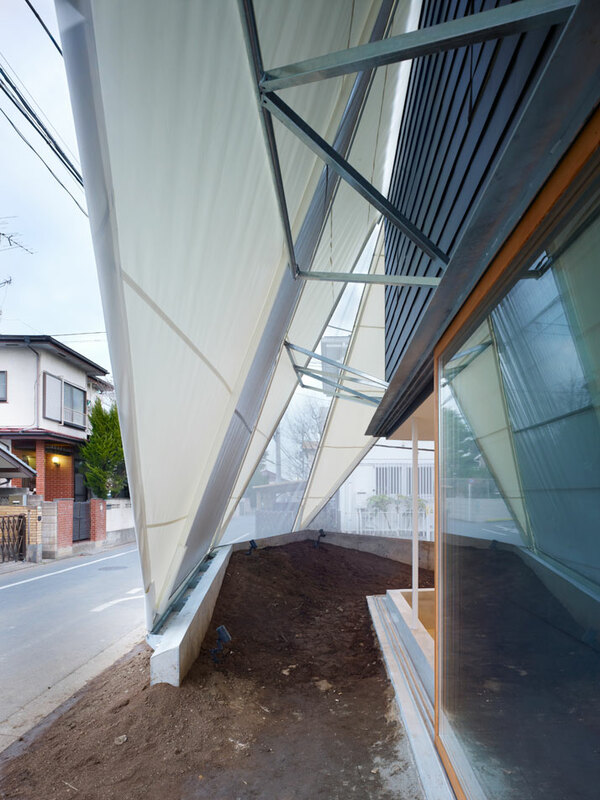 The architectural concept of the Kodaira-shi residence is that the residential structure is half-covered with a hexagonal shaped Tarpaulin to blur the barrier between the indoors and outdoors, thus creating a form of privacy for the residents who want to enjoy their unique garden which is located on the street level and is privacy-deprived. 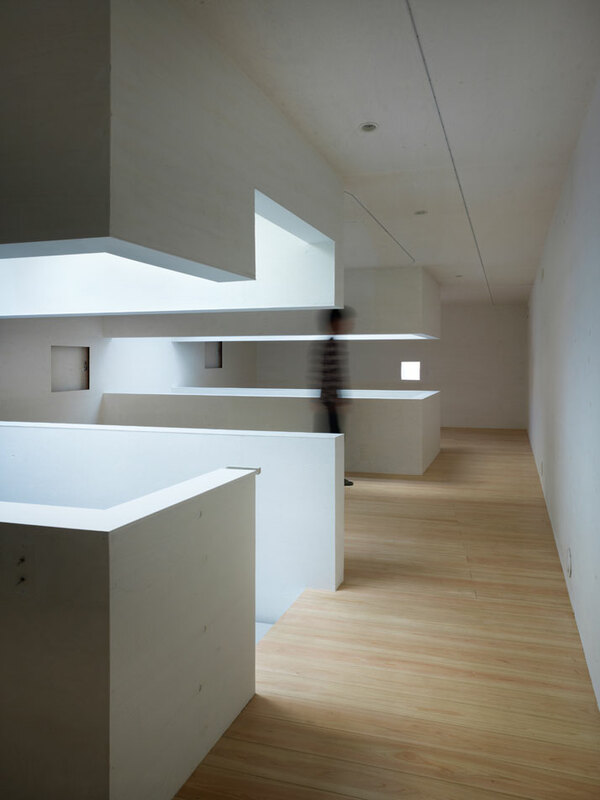 The Kodaira-shi residence is home to a family of four; a unique residential project according to the architects. The site is located in such a manner that it has direct access from the public street; as it is level to the street, it therefore lacks solitude. However, the owners asked for a garden, a private space for the kids to play and the family to socialize in the open-air. 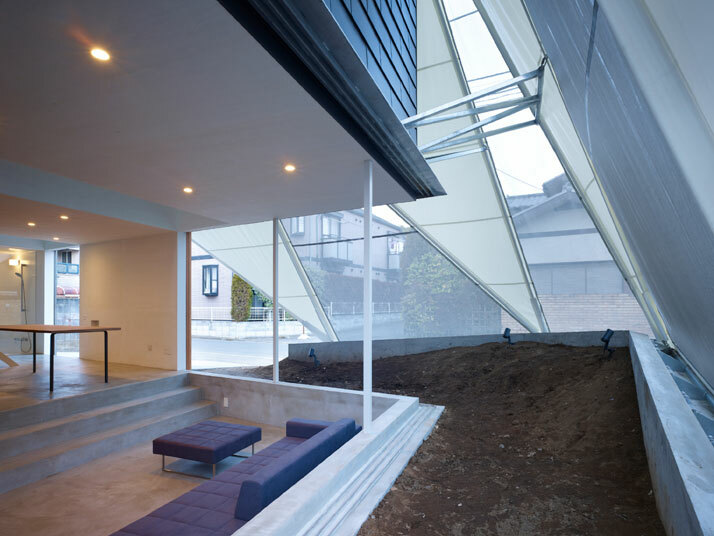 Due to the given conditions, the program called for designing a house which would be open to the outside, yet it would be able to provide for a private space which would create a barrier between the indoors and outdoors. 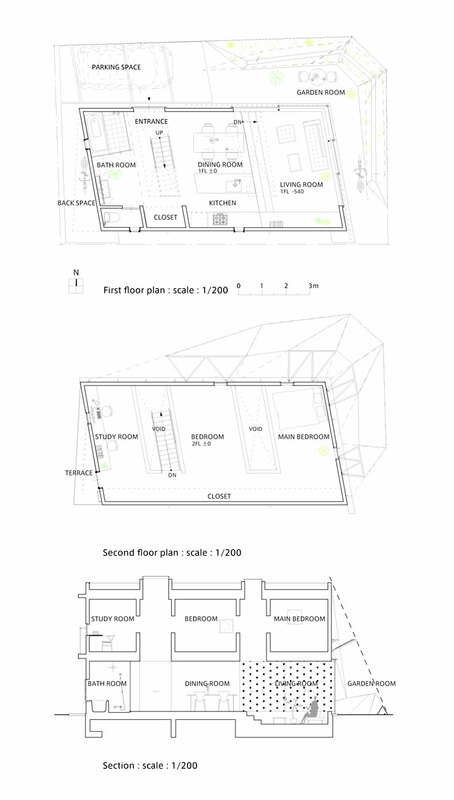 The total plot area is 117.29square meters (1,262.5 square feet) and building regulations restricted the building area to 50.87 square meters (547.6 square feet), leaving the residual as garden space. The principal asked for a garden which would be used as much as possible; a garden which would be part of the program and the architectural design. 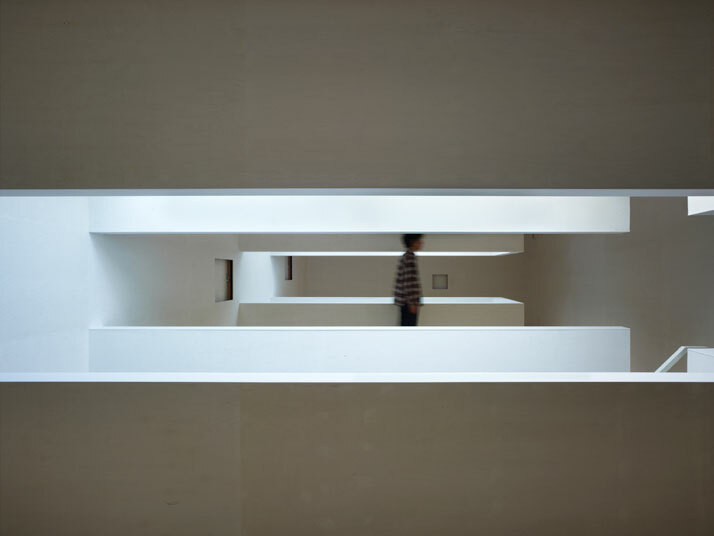 This would be a garden which would connect the exterior to the interior, but also act as an obstacle to the passers-by; making the courtyard as a semi-private zone. 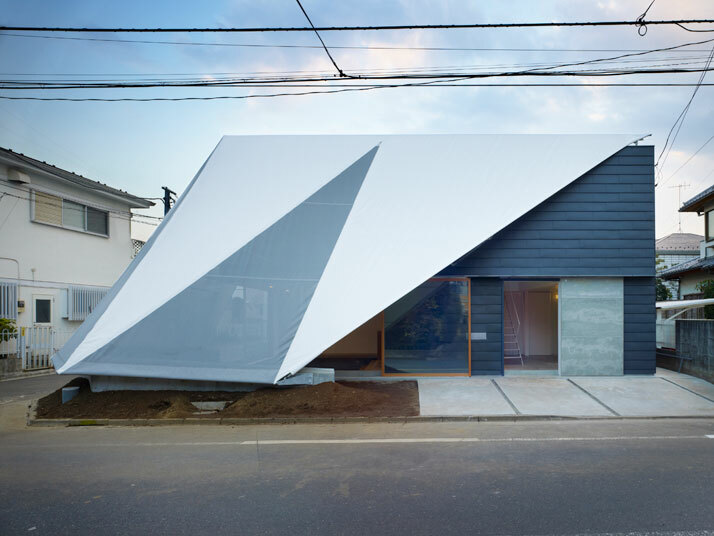 In order to surpass this challenge, the architects affixed a hexagonal tent structure to the residence. 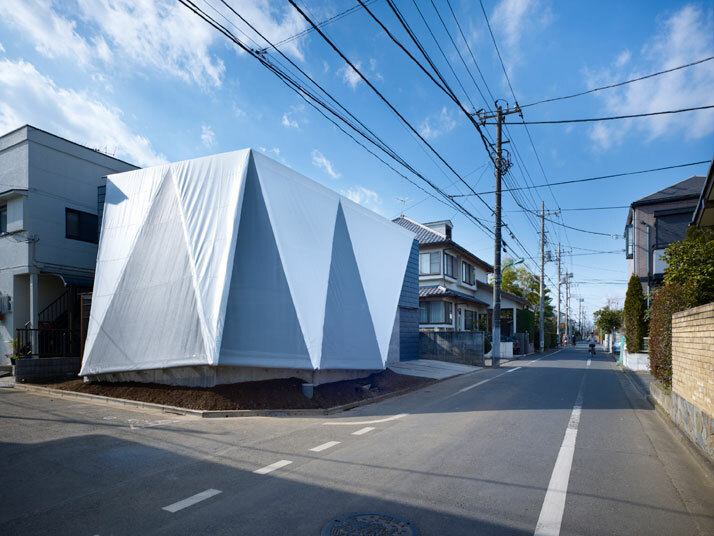 The structure works as a partition separating the two spaces and creates different zones; the Tarpaulin was used to blur the barrier between the interior and exterior. 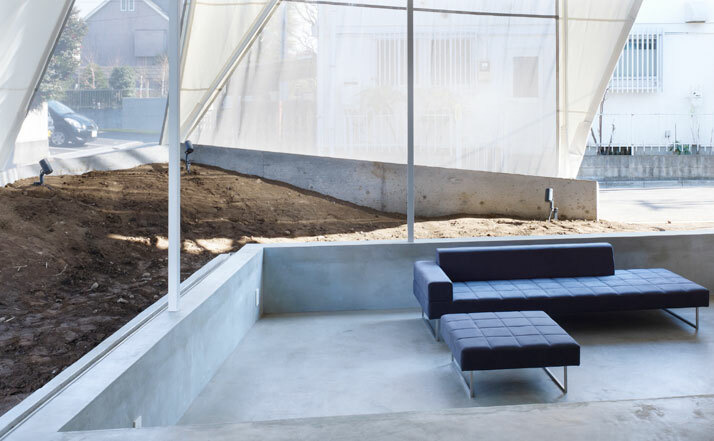 According to the architects, the primitive-like tent structure hovers over the garden acting as a roof, a wall and a fence. 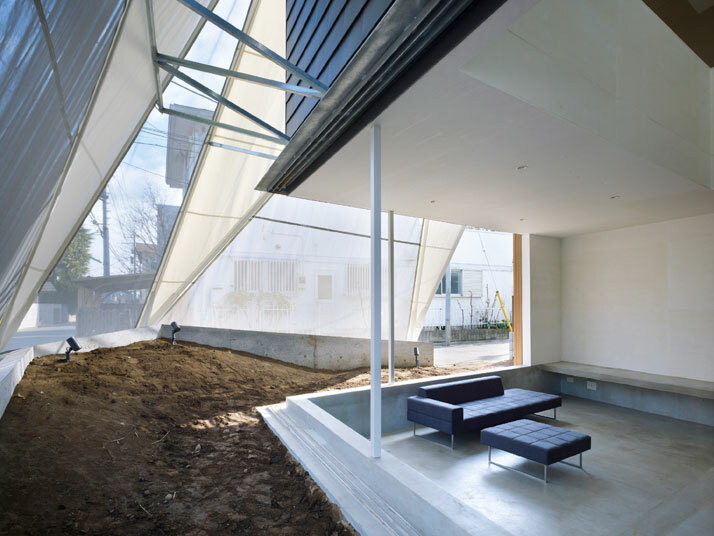 The tent-like structure generates an outside environment which blurs the boundaries of the exterior area and incorporates it into the interior. Moreover, the sliding glass doors in the recessed living room area can be completely opened so as to merge the front garden with the interior thereby marrying the pleasant garden space with the house’s communal area. 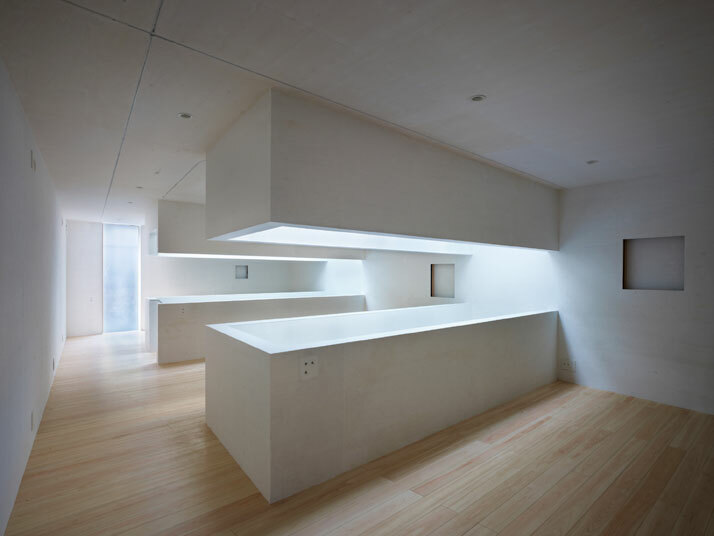 The architectural design for the Kodaira-shi residence takes up two-storeys totalling 93.04 square meters (1001.5 square feet); the ground floor occupies the communal spaces in an open plan layout including the kitchen, the dining room, the recessed living room, a private bathroom and a portemanteau are an addition to the open plan layout. 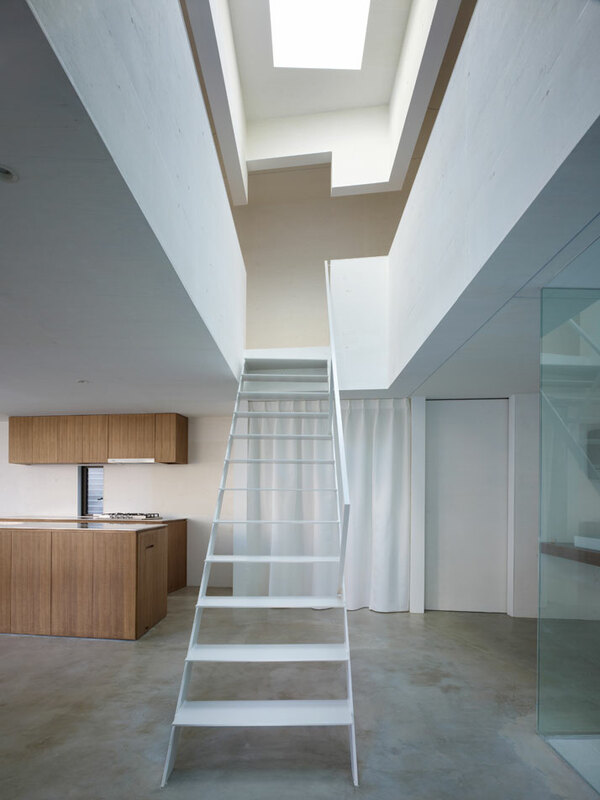 A linear staircase with a large void leads to the second storey where the private living quarters are. The second storey continues the open plan philosophy in opposition to the western-lifestyle trend where the bedrooms are private. A wall-to-wall wardrobe runs across the second floor. The space includes a study area for two kids, the kid’s room and the main bedroom for the parents. 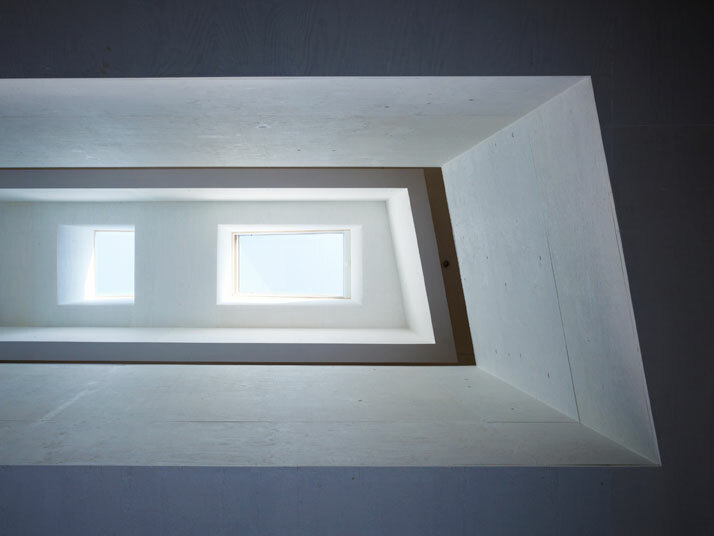 Two skylights which are positioned at equal distance from the exterior walls allow for ample natural lighting, thus enhancing the philosophy of the architects which is to bring the outside in! 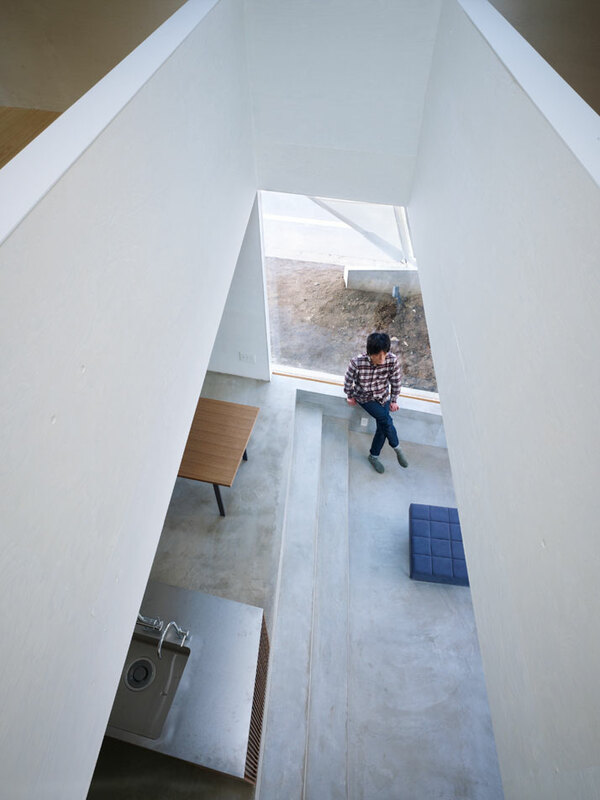 Suppose Design Office hopes that the architectural design for the Kodaira-shi residence will be a good initiative with which to create an environment where more communities will engage in this neighbour-like environment, like those that existed in the past and which still exist today in closed communities. 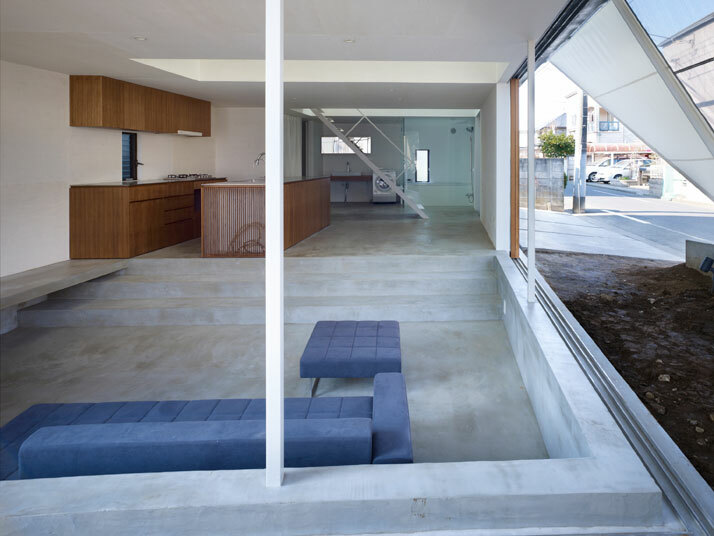 They anticipate that the Kodaira-shi residence will remind people of the new relationship between a city and the buildings - the buildings and the people – and re-evaluate the function, the program, and the meaning of the word HOME!